The big TNNA (The National Needlework Associaton) Fall 2012 Show is over. Vendors are heading home with orders to organize upcoming shipping and supply. LYS's are heading home to count how much money they spent. It happens every year in June somewhere in the Midwest. When I began my career, the TNNA show was in Chicago. June in Chicago was almost always hot and humid, but a whole bunch of fun with great restaurants to try to visit and all the anticipation of the upcoming Fall/Winter Knitting Season. The one thing I don't miss about traveling to the Midwest in summer was the flight delays due to the massive thunderstorms. People in the Midwest know how to knit, crochet, sew, and create. There is a great tradition in making things. For me, this June Show was always a fun and busy one. June TNNA is the biggest needlework show of the year. It is where new yarn companies launch, new books get signed, new designers flaunt their stuff. There is a new product area and it is a great way as a vendor to see what others in the business are doing. (If you are a vendor, it is polite etiquette to not walk into another vendor's booth - unless you are invited. Hence it is pretty impossible to find out what is new and innovative). Heather from Classic Elite knit this super cute Fair Isle iPad cover that I designed the colors and Fair Isle Chart for. It was on display with some of the new Color By Kristin yarn. This will be an upcoming "web letter" in the fall from Classic Elite. 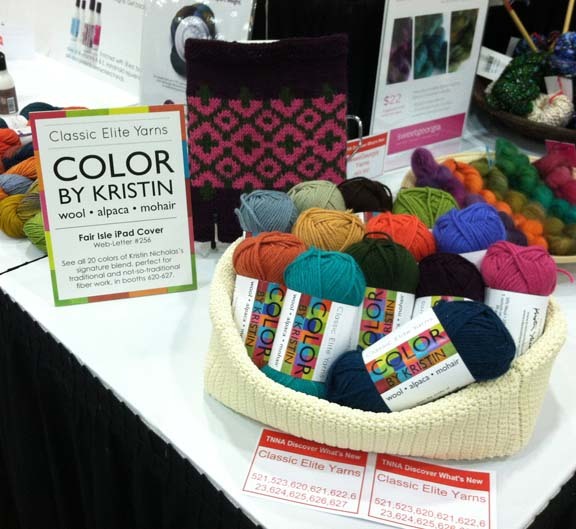 I didn't go to the launch of my new line of yarn - Color by Kristin. It is really hard for me to go away from the farm. And I am in the midst of a book project with more impending deadlines. When you go to a show like that, you lose a couple days before and after. I just don't have that time in my life this year. I am trusting that stores came to the show. I haven't heard how business was but I have my fingers crossed for all in the needlework industry. 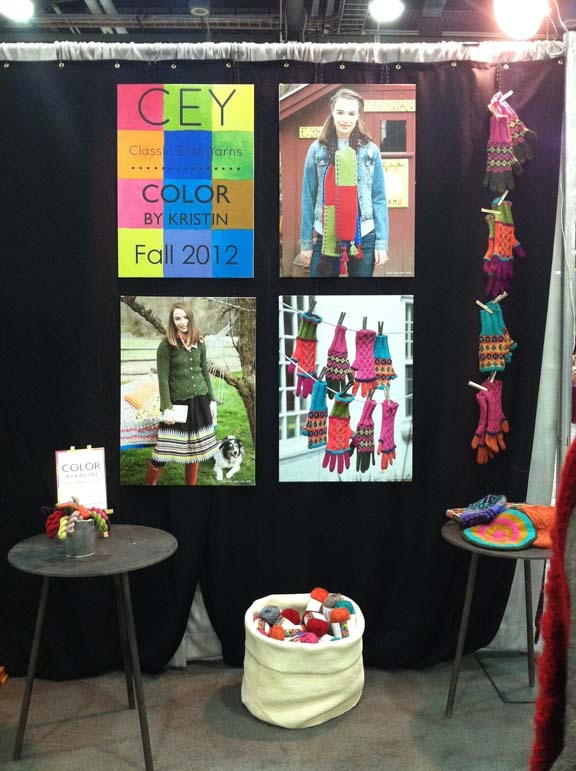 The photos in this post are of the Color By Kristin Yarn in the Classic Elite Yarns booth. 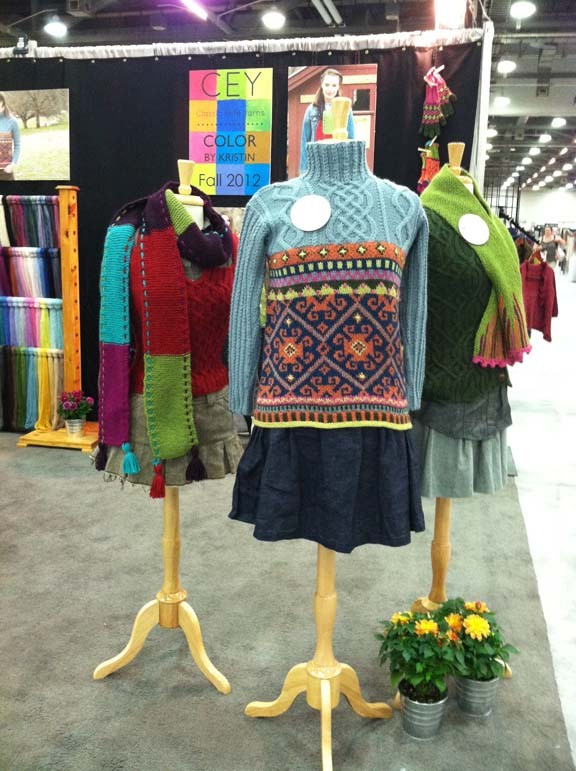 All of these garments and accessory designs will be printed into booklets and available at your local yarn store. I do not know about the on-line appearance and availability of these designs but as soon as I do know, I will let you know. Patience please everyone as we lauch this new line of yarn...... It is really nice to not be in charge, I must say. Over the weekend, I got this in my in-box from Seth Godin about the big brouhaha with the Olympic name and the knitters. Although this whole thing is pretty nuts and a misguided use of a whole bunch of people's time I think it is fabulous that Seth mentioned knitting on his blog. And it is on Gawker, Business Week, Slate, NPR.... It goes on and on. 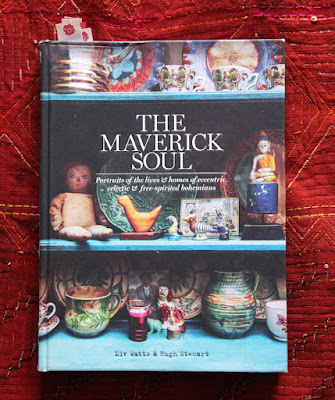 We (as knitters and makers of things) are sure to pick up some new converts, don't you think? Just look google "ravelry olympics 2012" and see what comes up. (Sorry, no links, internet slower than molasses even with 3G). any idea on the price point and yardage for your yarn? I might ask for some for my birthday! Over the weekend I saw a Bravo TV ad with many of their "Reality" "stars" touting the Olympics. 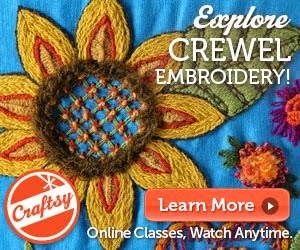 And they accuse Ravelry of denegrating the name of the Olympics! BTW, Love the "new" LABELS on the Yarn! I can't wait to see the patterns! The Yarn Harlot has a pretty interesting post on the Olympic issue. She comes out in favor of the Olympic committee and gives a number of thoughtful reasons why. Is the TNNA show for industry people only? It must be at McCormick Place--looks like their ceiling. The ball labels are great. Yes, it's verrrry hot here in Chicago--supposed to be 100 tomorrow!! Everything is political. This ravelympics bruhaha is just another example of persons with nothing better to do than find fault and place blame because they probably have no life!!! 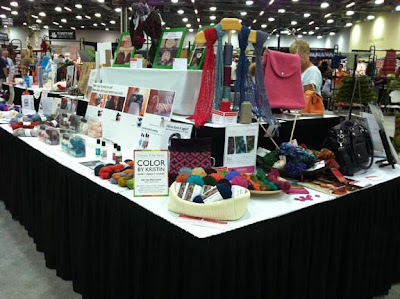 Great pics - are you going to be at the Knit & Crochet Show this week?